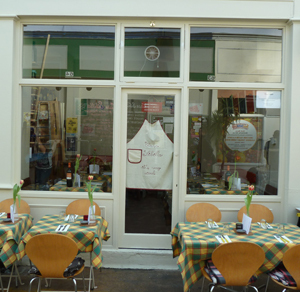 Casa Sibilla is an Italian restaurant in the buzzy new heart of Brixton in the Granville Arcade. We used to know this enclave of Brixton as a covered market that was full of sharks and fish of varying colours and vegetables that had to be boiled for days and then still seemed uncooked. However now it is a dazzling array of restaurants. The market is open on most nights (except Monday) to people browsing for food in the many different restaurants. I admit I chose badly – everyone knows that gnocchi can never be that great – but my companions chose well with a plate of mixed meats, plenty of bread and the best mixed olives that I have for quite a while. The octopus and mussel stew looked pretty meaty and was demolished. Partly this was because we did wait rather a long time for the food so we were ravenous and a little drunk as seconds of cocktails were called for. But we were warned about the likely slowness – due they said to a lack of staff. This was very surprising as there didn’t seem to be enough room for any more staff in the main restaurant which has an open kitchen smaller than the one in my own house. There was a clear system of movement so that Paola Sibilla (the chef) could manage the large saucepans and sizzling gnocchi so they didn’t collide with soup bowls. On price it was fair but definitely more than the usual Brixton fare but you do get what you pay for and I would recommend this place as long as the short menu changes enough to hold our interest. P.S there is a deli that sells good olive oil and I hope the olives and you can also buy their ravioli and other sweeter goodies.